Eurofighter Typhoon is built in the Preston area. Part of a European collaborative programme, 623 ordered by the UK, Germany, Italy and Spain, Austria, Saudi Arabia, Oman, Kuwait and Qatar. Greece has selected Typhoon. The Typhoon was preceded by a technology demonstrator called the EAP, Experimental Aircraft Programme, in the early 1980's. The EAP was built at Warton with the new wing and fuselage with canards. The carbon fibre wing being made in Italy. It used the Tornado rear end and engines. The one off build looking very like the current Typhoon. The project also built on work done at Warton using another technology demonstrator, a Jaguar configured for unstable flight with electronic flight control. Like many military and international projects politics played a large part in its creation. The existing Tornado partners seeming an obvious solution but with the French and Spanish joining. The French eventually going alone with the Rafale, a smaller aircraft. The EFA, European Fighter Aircraft, was launched with the four partners and similar engine and avionic partnerships and the first aircaft flew in 1994. The Germans reviewed the project after re-unification and decided to continue although all the countries reduced their order numbers. The first production aircraft flew in 2002. 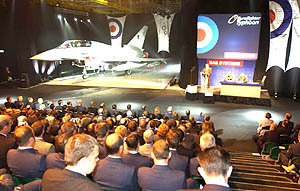 The project has continued at a much slower pace than originally envisaged mainly due to the political changes in East Europe and then the economic slowdown..
Development and production of the Eurofighter airframe and aircraft equipment is undertaken by two consortia each with representation from all four participating nations. The German based company Eurofighter GmbH (comprising: BAE SYSTEMS of UK, EADS* (Deutschland) of Germany, Alenia of Italy and EADS* (CASA) of Spain) are responsible for developing and producing the airframe, avionics and the other aircraft systems. They are also responsible for the integration of the EJ200 engine being developed and produced by Eurojet GmbH (comprising: Rolls Royce of the UK, MTU of Germany, FIAT of Italy and ITP of Spain). Over 400 companies are involved in the Typhoon creating 100,000 jobs. Work on the airframe is divided among the partner companies with Final Assembly taking place in the UK for RAF, RSAF and Oman aircraft, in Germany for GAF and AAF aircraft, Italy for IAF and Kuwait and Spain for its own air-forces. Eurofighter-typhoon.co.uk - lots of info, great site. >>Click here. Centurion includes several missile upgrades. The German Air Force is seeking a replacement for the Tornado. Typhoon is being promoted. The US is promoting the F35. The contract for 24 Typhoons for Qatar was agreed. Qatar is the 9th operator and 623 aircraft are now contracted. Brimstone, Meteor and Storm Shadow integration is well underway. The Royal Air Force of Oman took delivery of it's first Typhoon in Oman this month after a roll out at Warton in May. The Italian Air Force took delivery of the 500th Typhoon to be built. In April flight trials at Warton of the Electronic Scan, E Captor, Radar began. Trials in Germany will begin soon. The contract was signed between Italy and Kuwait and the 28 aircraft will be delivered from Italy. 22 single seat and 6 two seat aircraft with E-scan radar. The UK will deliver its part of the workshare which includes airframe, engines and systems. Eight countries have ordered Typhoon, a total of 599 aircraft with 470 in service. Eurofighter signed a new development contract with NETMA that will deliver enhancements by the end of 2015. This includes improvements to Radar, Defensive Aids, Flight Controls and other systems as part of a policy of continuous improvement. Over 200,000 flying hours have been flown by the Typhoon by 378 aircraft, 7 customers and 20 operating units. 719 aircraft are now contracted providing work for 100,000 people and 400 companies. Eurofighter signed a weapon system integration contract with NETMA for integration of MBDA?s Meteor Beyond Visual Range Missile system. Meteor is a beyond visual range ramjet missile that increases the 'no escape zone' around the aircraft. BAE Systems, one of the four Eurofighter Partner Companies within Eurofighter, completed a test-firing of a Meteor missile from a Eurofighter Typhoon, Instrumented Production Aircraft 1 (IPA1) off the coast of Wales. Further design and test work on the missile system will continue as part of the integration programme as BAE Systems, Cassidian, Alenia Aermacchi embed the system within the programme in the UK, Germany, Italy and Spain. BAE Systems announced it has signed a deal to supply 12 Typhoon and 8 Hawk aircraft to the Royal Air Force of Oman. From the 24th to the 29th January, Austrian Eurofighter Typhoons will again protect the skies over the World Economic Forum in Davos, Switzerland. The operation known as Daedalus 12 will see four Austrian Eurofighters deployed to protect the area in a temporary no-fly zone over Western Austria and Davos in particular. The Eurofighter will work alongside Austrian Air Force turboprop PC-7 trainers and OH-58 Kiowa helicopters protecting the skies against potential ?slow moving aerial threats? for the duration of the Forum. This task, in full coordination with the Swiss authorities, demonstrates the perfect interoperability of the Alpine Air defence system and builds on the successful experience gained from previous operations including the Euro 2008 football championships in Austria and Switzerland as well as the World Economic Forum meetings in Davos in 2011. The 300th Eurofighter Typhoon produced by the four partner companies of the European consortium, was delivered today by Cassidian to the Spanish Air Force, Ejercito del Aire. Eurofighter and Euroradar consortia have received renewed strong support from the Partner Nations and have agreed to continue the full scale development programme of the next generation E-Scan radar, confirming the 2015 entry into service date. Supported by the Eurofighter partner nations: the United Kingdom, Italy, Germany and Spain, Eurofighter GmbH and Euroradar began full scale development of the new CAPTOR-E radar in July 2010. The 100th Typhoon aircraft was completed in the UK's final assembly facility at Warton in Lancashire. The Indian Ministry of Defence on Wednesday asked European consortium's Eurofighter to extend the commercial bids for the 126 Medium Multi Role Combat Aircraft that are due to expire on Thursday. At Aero India 2011 Eurofighter and partner company BAE Systems unveiled for the first time more details about the studies carried out for the initial definition of the navalised version of the Typhoon. The most important element of the navalised Typhoon is that its exceptional thrust-to-weight ratio allows the aircraft to take off from a carrier without using a catapult, but with a simple and much cheaper ski-jump. Detailed simulations have shown that the aircraft will be able to take off and land in this way with a full weapon and fuel load. A key design driver for navalised Typhoon is 95% commonality with the land variant. The Eurofighter Typhoon has achieved 100,000 flying hours in service since 2003. The Eurofighter Typhoon has delivered 50 aircraft over the past year. Today the 250th aircraft is delivered. IS038 was handed over to the Italian Air Force in a small ceremony at Pratica di Mare base. The 250th aircraft will join 311 squadron as part of their current duties. Two German Eurofighter Typhoons are in Bangalore to take part in the Indian MMRCA flight trials. The Press Release from EADS Defence and Security states that Experienced test pilots of the Indian Air Force will examine the Eurofighter Typhoon's flight performance under specifically Indian conditions. The pilots have already been through rigorous training in Germany beforehand in preparation for these flights. The last Austrian Aif Force Typhoon was delivered to Zeltweg on 24th September 2009. Austria took delivery of its first Typhoon in July 2007. The four nations signed a contract for 112 Tranche 3a aircraft today just under half the total originally planned. The UK are to take a further 40 calling it Tranche 3a leaving the door open for the full order although some newspapers are reporting the ministry and RAF as stating they will not buy anymore Typhoons. A total RAF fleet of 160 instead of 232 with the difference being delivered to Saudi Arabia. The first two Typhoons for the RSAF were rolled out at Warton for delivery later in the month. The Prime Minister announced that UK will move ahead with the partner nations for Tranche 3. This effectively means the UK will initial the ministerial agreement that will initiate a bid from industry, theoretically leading to a contract near the end of 2009. Tranche 3 containing 88 aircraft for the UK continuing production beyond 2013. 4th March 2009 BAE SYSTEMS wins ?450m Typhoon Availability Service Contract. The UK Ministry of Defence awarded BAE SYSTEMS a five year contract to maintain the Typhoon at their bases. BAE SYSTEMS are providing a through-life capability for the Typhoon and will employ 500 people on the contract. 11th February 2009 Typhoon participates in Bangalore Air Show. Four German Air Force Typhoons participated in the Bangalore Air Show on the 11th to the 15th February with the A310 Multi-Role Transport Tanker and another Airbus. En-route the Typhoons refuelled from the tanker. 10th October 2008 Tranche 2 deliveries begin. Tranche 2 deliveries begin with the handover of BS040 to the RAF. In tranche 2 are 251 aircraft for the 4 partner countries plus 72 for Saudi Arabia. There are 100,000 jobs at 400 companies working on the Typhoon. 1st July 2008 Air to Surface Capability declared. The RAF declared the Typhoon ground attack capable after dropping a Paveway II bomb at the Green Flag exercise in Nevada. 5th December 2007 Eurofighter signs Saudi Arabia contract. The contract for 72 Typhoon aircraft was signed by Eurofighter with BAE SYSTEMS who are prime contractor. This brings the total Typhoon requirement to 707 aircraft. 30th March 2007 Air to Surface Capability contract signed. The 4 governments signed the contract to further increase the capability of Typhoon by improving weapon carriage and man-machine interfaces for air to surface roles. The first Austrian Air Force Typhoon flew today. The government to government MoU for modernisation of defence forces and an associated industrial plan was signed by both governments. (ref MoD website). On the 31st March No.3 (fighter) Squadron was formed at RAF?Cottesmore. A UK Ministry of Defence statement has been issued that an MoU has been signed between the UK and Saudi Arabian governments under which at least 24 Typhoons will be acquired to replace the RSAF Tornado ADV. The UK MoD is also reported to have stated that the aircraft will be diverted from the RAF?purchases in Tranche 2 which will be made up and will not detract from the commitment to Tranche 3. A figure of up to 72 aircaft is widely reported as the potential requirement. With 59 aircraft in service 5000 flying hours have been achieved. (Eurofighter News). The Eurofighter Typhoon, the latest addition to the RAF?s fighter force, will display its awesome power and manoeuvrability at this year?s Royal International Air Tattoo. The RAF has recently celebrated a milestone in the development of its new Typhoon aircraft with news of the successful firing of an Advanced Short-Range Air-to-Air Missile (ASRAAM). The trials, which took place during May, saw ASRAAM launched against targets at the Aberporth range on the Welsh coast. These were the first in-service missiles launched by Typhoon, with each successfully launched and guided to the target. Data from the tests have been analysed, confirming a successful trial where all the RAF's objectives were met. Air Chief Marshall Sir Brian Burridge said: "This is a highly significant milestone in the development of this outstanding new aircraft. Typhoon will be at the heart of the RAF's future fighting capability. Weapons such as the ASRAAM will ensure that Typhoon is a potent force for the future." Paris/Hallbergmoos ? 15 June 2005. The Government of Norway is to increase funding levels for its Eurofighter Industrial participation programme by a further 12.5 million Euros. The current Industrial Participation Agreement (IPA) signed between industry, Eurofighter GmbH and the Royal Norwegian Ministry of Defence is worth �23.2 Million. This covers six ongoing contracts with various Norwegian companies carrying out systems enhancement work on the Eurofighter programme. Ninety years after the Squadron was first formed at Gosport in 1915, No 17 Squadron officially reformed today at RAF Coningsby in Lincolnshire. Originally an Artillery Support and Reconnaissance Squadron, the Squadron now acts as the Operational Evaluation Unit for the RAF's latest front-line multi-role aircraft, the Typhoon. No 17 Squadron received its first Typhoons in 2003, while it was based at the BAE SYSTEMS airfield at Warton in Lancashire under the Case White programme. Case White covered the initial stages of the introduction into service of the new aircraft. On 1 April 2005, No 17 Squadron moved to RAF Coningsby and today is officially reformed as No 17 (Reserve) Squadron to undertake the vital role of integrating the Typhoon and its systems into RAF service. With deployment of IS002 from Alenia?s facilities in Torino to 4? Stormo ?Amadeo d?Aosta? at Grosseto, Italy, all for partner air forces in Germany, Italy, Spain and the United Kingdom now operate series production single seaters with Batch 2 standard. These aircraft have PSP2 Capability (Production System Package) with Initial Defensive Aids Subsystem (DASS), Multifunctional Information and Distribution System (MIDS), Initial Direct Voice Input (DVI) and Sensor Fusion. Six Batch 2 aircraft have been accepted by the customer air forces so far, totaling the number of now delivered series production aircraft at 41 (including 5 Instrumented Production Aircraft IPA). 11 April 2005 ? Eurofighter Single-Seaters in Operational Service with the Luftwaffe. Order for further 236 Typhoons signed on 17th December 2004. The 4 participating European Air Forces confirmed their order for a further 236 Typhoon aircraft. The RAF?will take 89 of these making a total order to date of 144 for the RAF. A further RAF?order of 88 is expected. The Italian Air Force have taken delivery of Typhoon IT002 in a ceremony at the Italian Air Force Base in Grosseto. IT002, a twin-seat aircraft, was handed over to 4th Squadron and is one of 29 aircraft to be delivered to Italy in Tranche 1 of the programme. IT003 and IT004 are currently at the Alenia Aeronautica final assembly facility and expect to complete national acceptance shortly. The Italian Air Force programme covers a commitment to 121 aircraft. In Italian service Typhoon will replace F-104s used for the defence of national air space. The go-ahead for delivery of the first Typhoon aircraft to the RAF was announced today by the Defence Secretary, Geoff Hoon. Type Acceptance marks a significant milestone for the programme, signalling satisfaction of the four Nations with the design and standard of the aircraft, and triggering the process of accepting individual aircraft into service with the Royal Air Force and the air forces of Germany, Italy and Spain. "There are few projects that can be said to be of greater significance than the Eurofighter Typhoon. This world class weapon system represents the single largest defence investment in the UK and will equip the Royal Air Force with a world class weapon system that will enable them to achieve air superiority well into the future. Industry and government agencies, both in the UK and overseas, can be proud of their achievements. "We must continue to work together to ensure the aircraft, as it enters service over the coming decade, harnesses the best of new technology to provide the RAF with the means of responding to new and emerging threats in this ever more uncertain world. "Today is good news for British industry. At the peak of manufacture, the project will sustain an estimated sixteen thousand jobs in the United Kingdom, including some 5,600 skilled engineering and production jobs in the north-west. This will help secure the future of the UK aerospace industry"
Following delivery of the first aircraft, the customer air forces will proceed with operational evaluation and initial training activities. For the first 18 months aircraft will be operating from BAE Systems facility at Warton in Lancashire using the company's technical facilities, expertise and infrastructure, before being transferred to RAF Coningsby, Typhoon's first home base. At an event held at BAe Warton aerodrome near Preston, Lancashire, also today, part of the ceremony was the signing of a type acceptance certificate by the Chief of the Air Staff Sir Peter Squire and Bae Systems Chairman Sir Richard Evans. The aircraft now forms part of 17 (reserve) squadron which for the moment will be based at Warton. Speaking at the event Sir Peter said "Type acceptance is a major milestone in any military project and repreents the culmination of countless strands of work stretching back many years. in this, the 100th year of powered manned flight, I truly believe that today we will be making a significant contribution to aviation history. 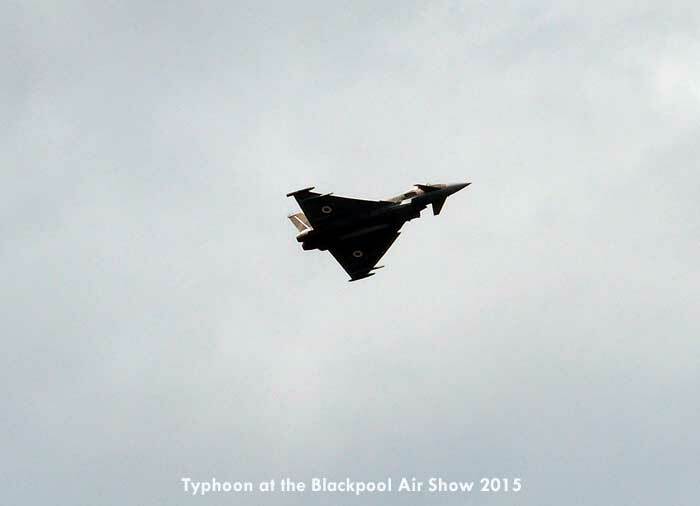 the sense of excited anticipation for Typhoon is palpable within the Service." Sir Richard Evans went on to add "that this milestone is a clear sign of the strength of the partnership between BAe Systems and its prime customer in delivering this truly awesome aircraft." 1. The aircraft is being procured incrementally with first tranche of 55 aircraft being delivered to replace the Tornado F3. With partner nations, we are currently negotiating a contract for the second tranche of aircraft with industry. We hope to be able to sign the contract before the end of 2003. Contractual commitment to the third tranche is not expected until 2007. 2. Typhoon is on target to be available for operational deployment in the second half of this decade. When it first deploys, it will primarily do so in an air defence role, though the aircraft will also have a limited ground attack capability. Progressive operational enhancements are planned to turn Typhoon into a truly multi-role weapon system, enabling it to replace the air-to-ground capability currently provided by our Jaguar fleet. Equipped with a highly sophisticated suite of weapons that will provide the RAF with the means of maintaining its battle-winning edge well into the future. The Eurofighter consortium has beaten off the challenge from Saab and Lockheed Martin to land a 1.79 billion euro export contract with the Austrian Government. Under the deal Austria will receive 24 Eurofighter Typhoon aircraft to replace its ageing fleet of Saab Draken fighters. Chancellor Wolfgang Schuessel announced after a Cabinet meeting that "The unanimous decision is for the Eurofighter, the Typhoon." This is despite the fact that it was widely expected that the contract would go to the smaller and cheaper Saab Gripen. The contract represents a huge boost for the Eurofighter team, which has been struggling to secure an export deal that would give the Typhoon a more secure reputation in the fighter market. The Eurofighter consortium has promised Austria twice the deal's value in offsets over a 15-year period. Deliveries of the aircraft are due to begin in 2005. The Eurofighter partners are Britain, Germany, Italy and Spain who have ordered a total of 620 aircraft, with the first production tranche of 148 jets running through to 2005. The second tranche begins in 2005 and the third in 2010. 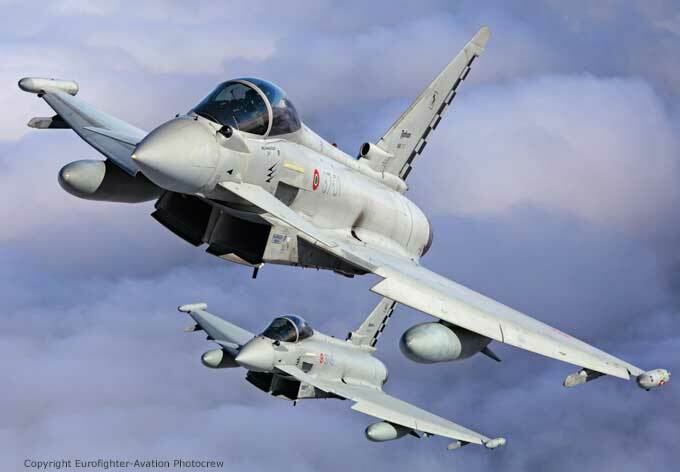 The Eurofighter consortium consists of Britain's BAE Systems, Franco-German EADS and Italy's Finmeccanica. "The Eurofighter provides the Austrian Bundesheer with the most up-to-date fighter aircraft, gives a boost to the Austrian economy and furthers European integration," said EADS CEOs Philippe Camus and Rainer Hertrich in a joint statement. "This decision will also send out a signal to other potential customers. In doing so, Austria has also strengthened Eurofighter's position as the future central backbone of a joint European air defence." "This is excellent news for the Eurofighter Consortium and the Eurofighter programme. Eurofighter represents a step-change in the ability of the nations receiving it to enhance the defence of their interests for the foreseeable future," said Mike Turner, Chief Executive of BAE SYSTEMS.